Catcher / 21 years old / 6’2″ 190 lbs. Nearly six months to the day after the Blue Jays parted ways with J.P. Arencibia—the last of four catchers to leave the organization over the past few seasons—they regained some valuable catching depth on Thursday night by selecting 21-year-old Max Pentecost out of Kennesaw State University. The 11th-overall pick used to sign Pentecost was given to the Jays for failing to sign right-handed pitcher Phil Bickford last year. Considered by Baseball America to be one of the best college hitters in the entire draft, Pentecost almost turned pro three years ago. As Pentecost worked his way through high school, something didn’t feel right. His throwing arm starting hurting in his sophomore year and continued to bother him up until one of his final games as a senior, when he felt a pop. Initially projected as a top-three rounds pick, Pentecost’s elbow surgery caused him to fall to the Texas Rangers in the seventh round. Turning down the Rangers and fulfilling his commitment to Kennesaw State turned out to be the best decision Pentecost could have made, as the Georgia native was drafted by the Blue Jays at a position that has a recommended slot value of $2,888,300. While the Blue Jays will likely try to save some bonus pool allotment dollars when attempting to sign Pentecost, there shouldn’t be any concerns about signing him. After hitting .277 with a .756 OPS in his freshman year at Kennesaw State, it was the arrival of new hitting coach Derek Simmons for the 2013 season that really helped Pentecost take his offensive game to the next level. Simmons dubbed Pentecost the best breaking hitter he has seen in an interview with Baseball America and mentioned some of the tweaks he made to Pentecost’s body at the plate. The changes paid immediate dividends, as Pentecost hit .302 with a .785 OPS and three home runs as a sophomore with the Owls. Last summer, Pentecost took his game to new heights with an improved mental approach in the Cape Cod League, en route to being named league MVP for his impressive .346/.424/.538 slash lane. That improved mindset carried over to his junior year in a big way in 2014 as well. Pentecost led his Owls team in nearly every offensive category including batting average (.423), hits (110), doubles (23), home runs (9), on-base percentage (.483), slugging percentage (.631) and stolen bases (17). The fact that Pentecost went 17-for-19 in stolen base attempts should really stick out, as it’s a testament to his athleticism and a rarity for a catcher nowadays. “Taking Max had nothing to do with any of those trades or getting rid of any of those players,” Blue Jays director of amateur scouting Brian Parker said. “When you pick nine and 11, you just have to line up your board and take the best player, and that’s what we did. We like Max. We scouted him pretty hard from last summer in the Cape and throughout this spring. “Offensively, Pentecost has a line-drive swing that stays through the zone with good bat speed and transfers his weight well to generate average power, mostly to the pull side. He’s shown an ability to work counts and a willingness to hit the ball the other way, so high averages and on-base percentages are not out of the question. His swing is more geared towards contact; but 15-18 homer seasons are not out of the question. Where Pentecost has improved the most since he was a prep, however, is behind the plate. He’s an above-average athlete who runs well for the position, and has shown an ability to block pitches in the dirt. His overall arm strength is only average, but he uses his athleticism and quick release to get rid of the ball quickly and he should do a decent job of keeping base-runners from running. 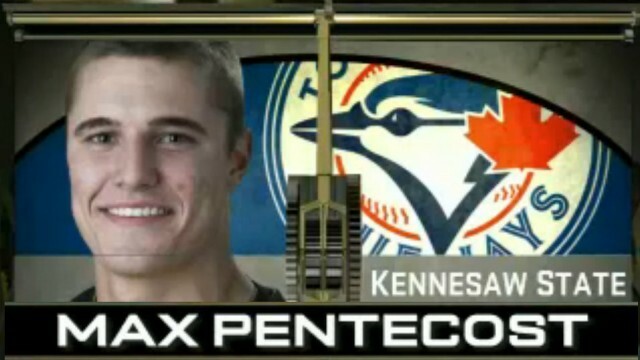 The thing I really love about the @BlueJays pick of Max Pentecost. He’s a do-it-all guy. Can run for a catcher, good defensively, good bat.